Start by lying on your back with your knees and hips bent as if you are about to do a crunch. Keep your spine in neutral alignment and your weight distributed evenly through your tailbone and both of your sit bones. Exhale as you use your abdominal muscles to curl up and extend your arms toward you toes, lifting them slightly off the floor. Inhale as you release back down to the starting position. Repeat, making sure you don’t press your lower back into the ground.Do 10-12 repetitions. Lie down on your stomach with your arms at your side and you hands turned in to your body. Slightly squeeze your glutes to keep them engaged. Exhale as you engage your back muscles and raise your upper body off the ground. Inhale as you lower back down to the starting position. Repeat, making sure as you raise that you glide your shoulders back and open through the chest.Do 10 repetitions. Start in a seated position with your knees bent and hip-distance apart.Reach your arms straight out in front of you. Inhale to make sure your spine is elongated. Exhale as you slowly lower towards the ground but only go about half way. Think of drawing your bellybutton towards you spine. Repeat, focusing on scooping your belly into a C shape.7. Do 10 repetitions. Lie on your back with your arms straight out in front of your chest reaching towards the ceiling. Exhale as you lift up off the floor, one vertebrae at a time, making sure that you don’t tuck your chin to your chest. Inhale as you reach for your feet. 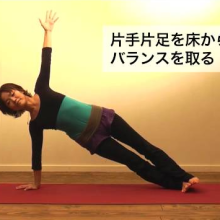 Try to think about relaxing your shoulders and keeping your abdominal muscles in a C shape. Exhale as you lower back down to the starting position, one vertebrae at a time.Remember to press your heels into the mat and do this exercise slowly, keeping your shoulders and neck relaxed.Do 10 repetitions. Lie on your back with your spine in a neutral position (not arched and not pressed against the ground). Extend your left leg towards the ceiling so that it is perpendicular to the floor. Breathe naturally as you make a circle with your left leg. Think of drawing circles on the ceiling with your toes. Continue to breathe normally as you lower your left leg back down to the floor.Raise you right leg into the air and make circles with this leg. Count one repetition each time your leg makes a complete circle.Do 10 repetitions. Start in a seated position with your knees bent. Lift your feet off the floor and grab your ankles. Make sure you are scooping your belly into a C shape. Squeeze your inner thighs together. Inhale as you roll back until your shoulder blades touch the floor, keeping your abdominals in the C shape. Exhale as you roll back up into the starting position.Repeat and do 10 repetitions. Lie back on your mat with your knees bent, your feet hip-distance apart and your arms at your side. 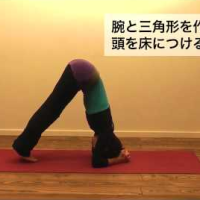 Keep your spine in neutral alignment, which means that it’s not arched but not also not flat against the mat. Exhale as you squeeze your glutes and lift your lower back off the floor, pressing into the ground with your arms, feet and shoulders.Inhale to lower back down to the starting position.Repeat, making sure to keep your breathing pattern throughout the exercise.Do 10 repetitions. Lie down on your stomach with your hands at the level of your shoulders but slightly wider. Make sure your elbows are tucked in close to your sides. Your feet should be hip-distance apart. Slide your shoulder blades back and exhale as you raise your upper body off the mat.Inhale to lower back down.Repeat, keeping your glutes engaged and your chest open on the exhale.7. Do 10 repetitions. 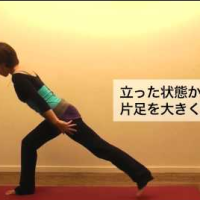 Start on all fours, keeping your head in line with your spine. Your hands should be shoulder-distance apart and your knees and feet should be close together but not touching. On your exhale, lift up into a push-up position. Keep your arms straight and your abdominals and glutes engaged.Inhale to lower back down to starting position.Repeat, making sure that your head stays in line with your spine.Do 10 repetitions.